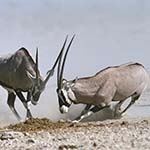 Explore the dramatic scenery of South Africa's west coast & Namibia on this exciting overland tour, travelling from Cape Town to Windhoek in a rugged overland truck by day and sleeping in rest camps overnight. Visit the Fish River Canyon, the gigantic sand dunes at Sossusvlei, Swakopmund, a Himba Village & Etosha. Group size 4 to 18. Activity package included. Camping option also available. We make a brief stop at the craft markets of Okahandja, before arriving in Windhoek. We take a short walk through the city centre and have the opportunity to view some of its better known landmarks, before your tour ends. Tonight we have the option to dine together at Windhoek’s most famous eatery, Joe’s Beer House, which has gained a reputation for its venison dishes and quirky atmosphere (own account). Transfer 1-hour to Windhoek Airport for your flight home.